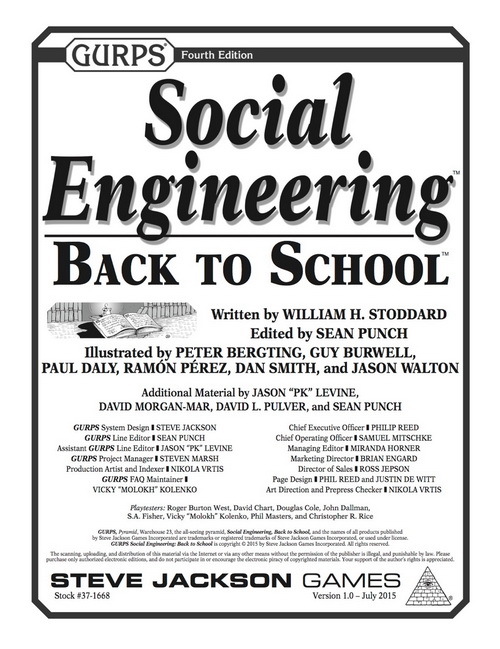 SJG published GURPS Social Engineering: Back to School not long ago. I’m a credited playtester, and one thing I can tell you about the playtest was that it was . . . lively. I use “scare quotes” and I shouldn’t, because I don’t much care for scare quotes. Or air quotes. But I digress. Still, the point of that rule is very diode-like: yes, if you go offline and bury your nose in studies for a while, you can turn that into character points. But the other way, that the only or primary method of increasing character ability is tied to a 200 hour per point metric just ain’t so. Perhaps that view is only prevalent on the forums, but it’s one of those guidelines that seems to cause as much trouble as help. Even so, working through the playtest draft, one of the things that came up was that at a strict 200:1 ratio, a full-time job will net you something like 10 character points per year, so (for example) someone like myself that has been working in a technical field since 2000 should have something like 150 points solely in job-related skills. We know this isn’t the case. Even were I dividing up all that time amongst Research, Administration, Savoir-Faire (My Company), Rank, Engineering (Materials Science), and various skills that might be called Professional Skill (Engineer), there’s likely no way I’ve put that time evenly and effectively into six to twelve different skills. More likely is that in a 2000-hour work year, perhaps 500-750 hours of real challenging work is actually done. The rest is . . . from a GURPS point of view . . . wasted time. Those meetings you sit in doing information sharing and Power Point status updates? Yeah. They don’t count. That at least takes my total down to 40-75 points or so. Likely still too high. The real kicker is that in all of that time, you’re really looking for growth opportunities. It’s why the first five years at a job are the most interesting and important, as you’re often exposed to the widest variety of opportunties to actually experience something new. I’d considered basing the time-to-learn progression on the Size and Speed/Range table in the past. What follows was a loosely-formed idea of taking a different route – one that I remember was used in RuneQuest. So . . .back to GURPS. What can we do to the metagame equivalence that is off-screen learning to make things more interesting? The “200 hours of experience” thing is no longer a 1:1 basis for exchange for character points. Instead, it’s the basis for a skill roll. You may roll for taking more or less time, using double the size/speed range progression, but treating less time as a bonus, not a penalty (you’ll see why soon). So 150 hours is +2, 100 hours is +4, 50 hours is +8, etc. After studying for X time, make a skill roll. If you MAKE the roll, everything you’ve encountered in the last X hours has been within your current realm of experience. You gain nothing from that time, and don’t bank it for anything, that time is lost, etc. This is basically the RuneQuest mechanic. If you fail the roll, you’ve encountered something new, and with a second roll – a Will roll, perhaps – you may be able to leverage this challenge into learning, and gain a point in the skill. Using two separate rolls here is one way to go. Another would be to look at the relative skill level of Will compared to other quantities, or heck, just making a Will-based skill roll instead of two rolls. That being said, hopefully the frequency of rolling is low enough that burning two rolls here isn’t terribly onerous. Intensive training or routine job work would also modify the roll. I didn’t flesh this out at the time. Low skill levels, such as defaults which will often be in the Skill-4 to Skill-6 range (or as high as Skill-8 for IQ/DX of 12) will pretty much get the benefit of frequent opportunities to increase skill. Skill-6 will find something new almost always, even with short exposures to the material. Experts at Skill-14 will spend about 10x as long before encountering something new enough to merit a point increase through study or routine training. It makes the 200 hours thing a guideline or norm, rather than a rule. It’s possible, though unlikely, that you can study for 20 hours (-12 penalty to the effective roll!) and earn a point. It provides motivation for getting out there and adventuring, since that’s a great way to encounter crazy situations out of your experience. And of course, you don’t count hours adventuring . . . you just spend earned points with GM permission. If you don’t mind the die rolls, the secondary Will roll to see if you can assimilate the experience into skill provides another way to emphasize the importance of mental grit. The role of teacher can be played with. It might guarantee (provided the teacher has the right materials and experience herself) that the student is exposed to things they have never seen before, or at least enhance the probability. MoS on a teaching roll might go directly into lowering the effective skill for the purposes of “was this something I already knew?” THEN the student might have to roll on their own for Will, or at best the teacher’s skill gives the +1 for a success, +2 for a crit. I think that’s in line with Shawn’s observation that integrating presented material is mostly a function of the student. The dual element of risk (did I encounter something new? is my Will high enough to actually learn the offered lesson?) again provides more incentive away from sitting in a library and reading books, and more stressful and interesting conditions. Even if you’re defaulting to a skill level of 6, spending only 20 hours gives you a bonus (remember, you’re looking to fail the roll) of +12, or an effective Skill-18. Odds are, you need to study long enough 30 hours instead of 20 to bring that down to at least a roll vs. Skill-16 before you even have a small chance of finding something learnable in that little time. Overall, I think this mechanic – or something like it – would achieve several goals that might be desirable in a time-to-character points metasystem. Provides for more rapid initial learning. Prevents everyone that has been in a job for 10 years (and that person could be in their early 20s in some skills) from having very high skill levels. Allows dedicated learners with high Will to still become prodigies in a short time. Someone who does have Skill-14 may well take two years, on the average, per point of skill (400 hours, but only 10% new stuff), which means about eight years to get to Skill-15 . . . unless they find a new role outside their current experience. On the other hand, I didn’t really playtest this or throw scenarios at it. Things would likely need to be adjusted to make them work just right, and “just right” may well be campaign dependent. But it seemed like a neat little concept, which had been exercised in at least one other RPG, that would take the focus off of clock-punching by adding elements of risk to the learning process. Instead of “you fail a skill roll,” which is a bit opposite the usual GURPSy way of doing things, you might borrow from Divine Favor and invoke some sort of reaction roll instead, with better and better reactions giving benefits. You're probably better off ditch Will, which is already extremely powerful and useful for 5/level, and just re-rolling the skill. Possibly based off of IQ. 1) Fail under pressure. This means there is something to learn. 2) Re-roll and succeed. This means you are skilled enough and knowledgeable enough to understand and assimilate the lesson. This means there is a sweet spot of "bad enough to encounter a lot of new things but good enough to learn." Yes, and it's on purpose. You learn a lot initially when trained, but not just from trying and failing. You fail at a lot and don't adapt because the lessons are beyond the support structure of knowledge and ability you've built so far. You just aren't ready for it. At the other end, it's hard to set up situations where you can legitimately encounter new stuff to assimilate – something very skilled people in the real world generally find a way to do. This method has the advantage that you can easily calculate the "succeed by X" margin as a function of skill, and thus reduce it to one roll if you want to. I like this system. It removes the guarantee of progress, and better reflects reality. Even if you cut out meetings at work, most of what we do is doing our job – we already know all that. At best, we find some shortcut or detail that was previously obscure. Also works in schooling; we don't always go into class knowing nothing about the subject at hand. If you want this without the randomness, or should one be bothered by the fact that a lucky and unlucky player will grow to have different point totals through a sheer RNG fickleness, you could combine this with This One Goes to Eleven (Steven Marsh, Pyramid #65): You need an adjusted skill level of 10 to learn anything, time and teaching can help you get there. * The need to fail a skill roll effectively doubles the base time, so maybe adjust it to 200 hours self-taught (400 On the Job, 100 hours taught, but see below) to maintain consistency. * Teacher MoS is very powerful, and will likely become the defining factor for advancement: MoS 5 is as good as taking thirty times longer! Studies show this isn't necessarily unrealistic, though. My suggestion: RAW say Teaching 12 is required to make it twice as fast as self-teaching, so I suggest a percentage bonus of (Teaching-2)squared to earned hours, with no cap. This makes Teaching-16 the expert teacher from Intensive Training (p. B293) and has the same curve as BL. I don't have Back to School yet, but you seem to be missing some rules in the Basic Set. 1) On the Job Training isn't a 1:1 equivalent, it is 4:1 just like with language immersion. 2) Quick Learning Under Pressure (aka spending earned points on new skills) already has a learning roll. I am not "missing" the equivalencies. I am repeating points that have been made (incorrectly, I agree) in terms of hours of work experience in a year translating to points. Further, spending new points on skills from adventuring, at least in my games, would never require a learning roll. You spend them where you like as long as I agree it's possible. Fair point about my assumed 4:1 being actually the rules, but it still makes for a level of accumulation that is probably too much, though certainly 15 yrs at 2.5 points per year for 35-40 points spread across a bunch of skills is BETTER than 4x that value. But it's still enough to get (say) 8 points each in 4-5 skills, which is enough to get from IQ (on a Hard skill) to IQ+3 (Easy). Eh, maybe that's not too bad. The Quick Learning Under Pressure rule is RAW (B292), ignoring it (as say DF does with the Training Costs rules) is probably pretty common, but I didn't make it up. I find it problematical mainly because it requires that you remember what skills you rolled by default last session, which is kind of a lot to ask.